Cathleen Dringo, a Community Development Officer at Kimbe Urban LLG, presented at the workshop. 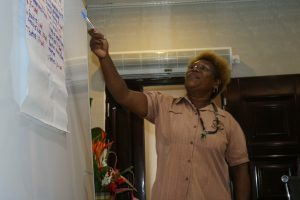 West New Britain has prioritised merit based employment and equal access to opportunities as part of the Gender Equity and Social Inclusion (GESI) Policy rollout in the province. The GESI Policy has been piloted at provincial level in West New Britain and it has now been taken to district level in Talasea. 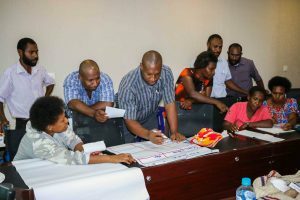 The Department of Personal Management recently hosted a GESI Policy workshop in Talasea to demonstrate how the GESI Policy can meet provincial and district priorities and how it can be mainstreamed into public sector work at district level. Provincial Administrator William Hosea said he was grateful that West New Britain was entrusted to pilot the rollout. “The province has captured GESI activities in its corporate plan and we are looking forward to the implementation of the policy,” Mr Hosea said. “We talked about effective service delivery. The way we think and the way we do things must be a coordinated effort, working together as a team and valuing the contributions of women. Public servants from Talasea District and LLGs worked together at the GESI Policy Workshop. Talasea District Administrator Robert Dau thanked the Department of Personnel Management and the Australian Government for their support of the policy rollout in the district. “Talasea is a very big district in the province and gender equity is very important,” Mr Dau said. “I am very happy that officers from the District are attending this workshop because the policy requires everyone to work together,” Mr Dau added. The GESI Policy has been given prominence in West New Britain since it was first introduced 18 months ago and has been integrated it as part of business processes and service delivery. The workshop was facilitated by the Department of Personnel Management and the West New Britain Provincial Administration, and supported by the Australian Government.